Open Financial Exchange (OFX) is a unified specification for the electronic exchange of financial data between financial institutions, businesses and consumers using the internet. This file format and protocol allows software like MoneyWell to ask your bank about account information and to download transaction activity. It is often called Direct Connect Banking. You can easily enable direct connect banking in MoneyWell by adding an account. First, make sure that you have signed up for direct connect banking with your financial institution. They may require you to pay a monthly fee and you also may be given a different username and password than you use to log into their website. When you choose New Account from the File menu, MoneyWell will present you with a list of financial institutions. Pick one and then click Continue. If our database shows that this bank supports direct connect, you will be prompted for a username and password. If not, an error will be presented. For more detailed steps, see Adding Accounts. If you have an eligible bank, type your username and password and press Continue. 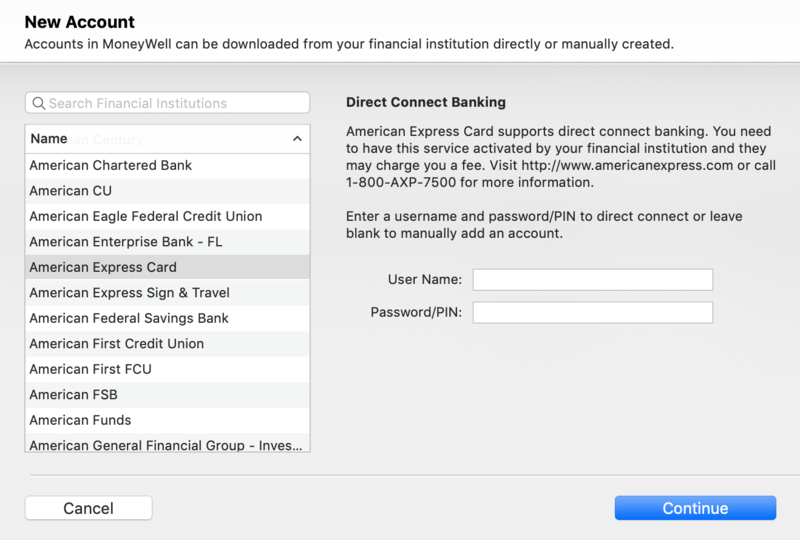 MoneyWell will attempt to connect and download your available accounts. If you see a 15500 error, it means that your account isn't set up for direct connect banking yet. Contact your financial institution for assitance. 400 - "Bad request" typically means something is wrong with the information provided. Check to make sure your bank account type is correct and also that your account number and routing number exactly match what the bank expects. Contact us if you can't see a problem. 500 - "Server error" often happens when there is a problem with the bank's OFX server. Wait a few hours and try again. If this doesn't go away, you might want to contact your financial institution. 2000 - "General error" could mean that the server is having problems. Treat it like either a 400 or 500 error. 2002 - "General account error" usually means your account number or type is incorrect. Check and correct these on your account. 2003 - "Account not found" means your account number is wrong. It may have changed if you cancelled or renewed a credit card. 2004 - "Account closed" means just that—it's closed and cannot be accessed anymore. 2005-2010 - Are all errors similar to 2003 and 2004. Check your account information and make sure you have direct connect access turned on for them by contacting your financial institution. 15000 - "Must change password" means your password is currently invalid. MoneyWell will prompt you for a new one if the bank allows this via OFX. If not, contact your financial institution for help. 15500 - "Sign on invalid" is the most common error seen. It means you are either using the wrong username and/or password or that your account hasn't been activated for direct connect service. First check your username and password and then contact your financial institution if you still have a problem. 15501 - "Account in use" means there is a bank issue. They may be doing maintenance and you just need to try again later. 15502 - "Password locked out" means you tried the wrong password too many times. Contact your financial institution to get it unlocked. 15503 - "Could not change password" means just that. For some reason your new password is being rejected. Make sure you check that it's the right length and type. Some banks want numeric PINs and other full passwords. 15510 - "User ID has expired" could be a temporary problem with your financial institution or you could need a new user ID or password. 15512 - "Maximum password retry reached" means you have tried using an incorrect password too many times. It will have to be reset by your financial institution. When contacting your financial institution, you can save yourself some problems by not mentioning that you are using MoneyWell. Too often, they won't even talk to you if you are using anything but Quicken. There is no difference with how MoneyWell talks to your bank compared to Quicken, but this prejudice is common. Just say you are having trouble connecting and Quicken is giving you one of the above errors. It seems like the writing is on the wall for OFX as a direct connection for downloading transaction data. We regularly get asked to investigate problems with a particular bank's connection where the problem turns out to be that the institution in question has stopped providing an OFX service. We've already started investigating how best to provide direct import of financial transactions going forward and are exploring a number of different options, but a transition of this kind is not a quick fix. We hope that the solution we come up with provide added benefits beyond just replacing the existing service, particularly: access to a wider selection of institutions and covering a broader geographic area. Any news about developments in this area will be published to our blog.